Update: The US Apple Store Black Friday event has started. The offers include discounts on Mac, iPad, iPod and accessories. 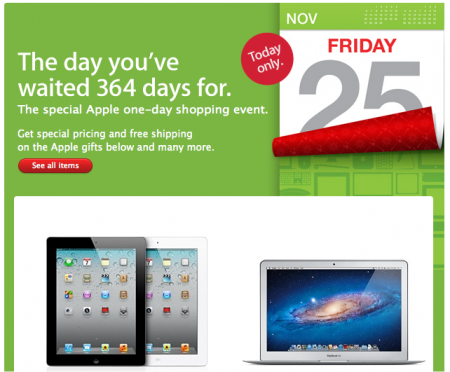 Apple has started their one day sale for “Black Friday”. The sale has already started in the Australian Apple Store and will be available in most of them within hours. You can browse the current Australian Apple Store discounts or view them here. The discounts include Apple products (iPad, iPod, Macs) as well as accessories. I highly recommend checking out accessories by inCase and Jawbone. Be sure to revisit the United States special shopping event page after a few hours.